In a world where we depend on technology, we also depend on power. Smartphones are requiring a lot of power and the worst thing can happen while you are away is to remain without battery. Yes, you can charge your phone from a public socket, or you can charge it from your car, but don’t you want to have an independent solution that can be used anywhere ? Now you can charge your phone, tablet and any other devices you have with you using only energy from solar. You only need a portable solar panel. Today’s technology allows you to produce electricity almost everywhere. 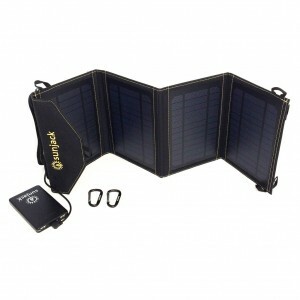 The portable solar panel from Sunjack can produce a maximum of 14W, and can store 8000mAh of power. Has an outlet charger that provides 2A at 5 volts. The battery is fully charged in approximately 5 hours. The most interesting fact is that it folds to a compatct size of an iPad, so you can easily carry it with you. This is a must-have for camping, travelling or other emergency needs.